At Precision Movement, our mission is to help active people (like you!) eliminate pain, heal and prevent injuries and improve mobility so they can get back to and keep doing the things they love. 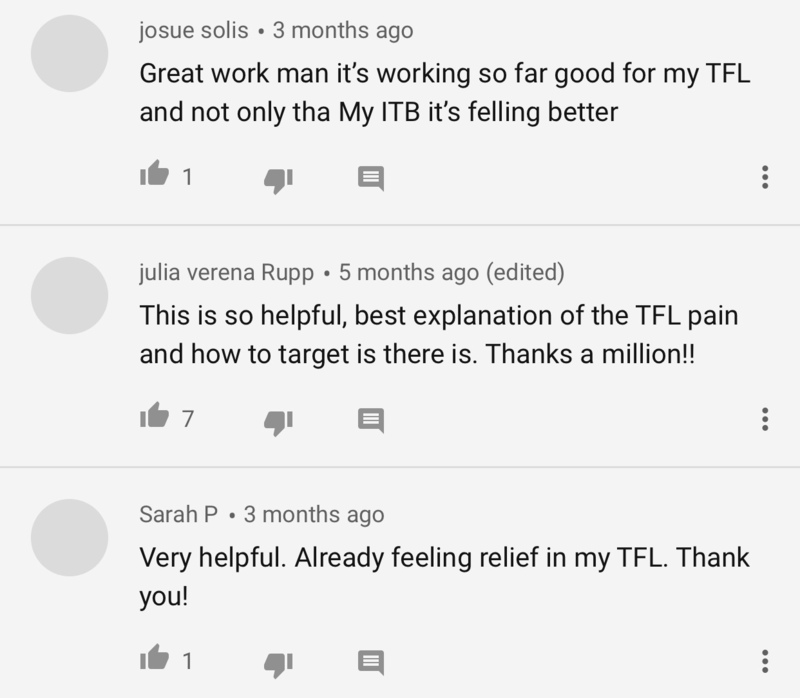 We're proud of each and everyone of our followers who use our free content and premium courses and on this page we've highlighted a small portion of the feedback we've received that inspires us to keep doing what we love and that we hope inspires you, whether you've been sidelined by pain or an injury, limited by a restriction or want to stay active and mobile for the rest of your life. I love your stuff - your words and your programs and I'm very grateful for them restoring me to action! Here's a pic of me at a bouldering competition earlier this year - this was after your shoulder flexibility solution helped clear up a nagging pain in my right shoulder. I didn't score any points at the comp and I'm full of chalk from all the falling! but, I had a great time and no pain 🙂 - and I could keep on climbing - fantastic. The 4 weeks of doing HFS (Hip Flexibility Solution) have really helped. Left hip flexor is no longer inflamed, and I don't feel like an 80-year-old woman any more when I get up from sitting for long periods (which I try to avoid, but I AM on the bus for an hour every work day). I'm not experiencing soreness while running, and my body responds better after I run. I still have a way to go, but I've definitely seen the fast results you mentioned I would. And the exercises don't really take that much time and are easy to incorporate into my day. I have been impressed enough with your system that I purchased the Shoulder program as well--and a few other programs. Thanks for creating such useful and helpful training tools! I have practiced martial arts for 45 years ( I`m in 57) and the last 20 I do Taekwondo WTF (World Taekwondo Federation). I compete in an specialty called Poomsae, same to Kata from Karate. With my age it is difficult to maintain flexibility and mobility with good form. The poomsae competition is very challenging with kicks, and it is for this reason that I looked for a good hip program. I acquired Hip Warm-up and Hip Flexibility Solution that I use for myself and my students and now I want to complete the HIP CONTROL course. My goals are to kick more high and with more control, bettering the balance. I send you a photo of my lateral kick in the last World Poomsae Championship 2016, Lima Perù. I follow you since several years, your exercises helped me a lot , I`m sure that this course will be very useful to me. Our subscribers are active people who love to move and push themselves to be better everyday. If this sounds like you, signup for our newsletter where we typically send out 2-4 emails per week with the latest articles and exercises on eliminating pain, injuries and improving mobility. Thanks for sharing your thoughts and results with us! Why did I invest in Hip control? Well I’ve actually invested in Hip Control and Hip Flexibility and am starting with hip flexibility. I am here because I love endurance trail running. I had to stop running in the end of January 2017 due to too much pain in my right low back and hip area. It’s never gone away. I started and stopped several times between then and Oct 2017 but the pain was just so debilitating. I realized rest wasn’t working for me. In Nov i started up again. By mid Dec i was back at square one and could barely move. I’ve had hip and low back x-ray and outside of some very minor degenerative disk between L4 and L5 there is nothing anybody can see. I believe therefore that i should get better. I found out that my glute mead wasn’t firing. I searched the Internet for some exercises and found you. The exercises for glute mead activation felt really good. I signed up for your 5 day hip flexibility and mobility challenge. Your exercises were amazing. I hadn’t felt this good in a long time. So here I am. :). I’ve got a running training plan to build myself back up slowly and I’m in the gym 6 days a week. I still have pain, but I’ve seen a tremendous amount of improvement over the last two weeks. Thank you!! Here’s hoping I’ll be back at 50km + training again soon!! I found the program very informative with great advice and it answered a lot of questions that I had. I learned so much about my forearms and how important grips are. Just to get the tension released and feel strong again in my forearms and elbows was perfect. I found it very empowering to learn how to take better care of my own body. Being practitioners of Brazilian Jiu Jitsu we tend to use our grips quite a bit and Eric did a great job teaching us about what we should and shouldn't be doing as athletes to make our upper limbs function better. Eric Wong saved my life! This is probably a long overdue email and it was only when I received your email saying that I had been inactive for a long while that I thought I'd better send this. I have always lifted weights and did some bodybuilding when I was younger. I even entered the Darkside a little bit but about 2 years ago I seemed to develop severe bursitis in both shoulders and had a torn rotator cuff with a 10 mm tear. In all the scans and the two surgeons that I saw said the only way was to have surgery and I would never lift weights properly ever again. While in a state of depression I was scrolling through the Internet I came across Eric and after reading I decided to purchase the shoulder flexibility program but more importantly the scapula strengthening program from him. I began working through the scapular strength program from the start and eventually found out that my shoulder felt better and better. Although I could not lift weights it also gave me a sense of purpose. I still could keep in a routine by going to the gym and keeping in contact. Although I am now 51 years old and not as strong as I used to be I'm still managing to bench press 140 kg and military press 90 to 100. 2 years ago I never thought I'd even be there. I could not even brush my teeth or work properly as I said at 51 years old. I know that the tear will still be there but with the added stability in my shoulders and scapula I think it has counteracted this. I still struggle on some days with pain but I still religiously do a scapula strength routine before every single workout. So although the title I gave this email was Eric wong saved my life it may have been a bit melodramatic but without going to the gym my mental state would not have been good. Thanks to you for being the real person to obtain information that works. You have supplied me with the how-to's that have helped ME! Because of some (a lot) of limitations that don't seem to have Doctor answers (a pill or shot for pain for whatever ailment), even making the attempt to do your program(s) has aided me in either try-it - use-it or just know-it and when possible I share what knowledge I gotten. Thank you.